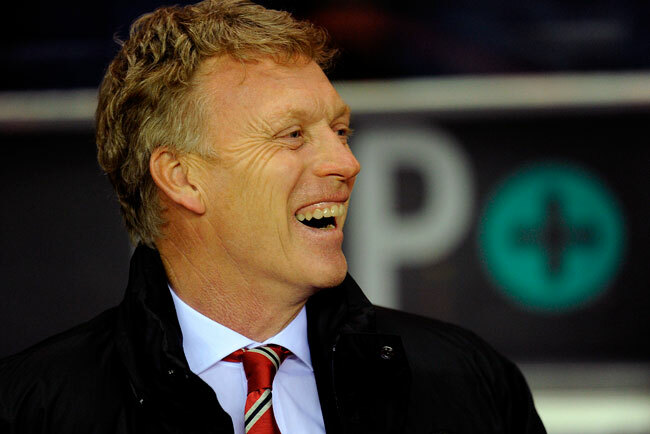 Manchester United manager David Moyes sees the funny side of his side’s dismal run. While the rest of the country laughs at them, Manchester United players, according to their manager David Moyes, are “beginning to laugh at referees” for their “terrible” decisions following a third successive defeat. Fabio Borini scored from the spot to give Sunderland a 2-1 win in the first leg of their Capital One Cup semi-final after Adam Johnson was adjudged to have been tripped by United midfielder Tom (not so) Cleverley. The under pressure United manager said his team were “playing referees as well as the opposition”. “We’re actually beginning to laugh at them, that’s the thing”, he said, somewhat desperately. On New Years Day, Moyes, who has taken just six months to shed his reputation as one of the more measured Premier League managers, said it was “scandalous” United were not awarded a late penalty in their Premier League defeat by Tottenham at Old Trafford. “How could the linesman give that?” he complained following the latest defeat at the Stadium of Light. “The ref was looking straight at it but the linesman would have to have seen straight through Patrice Evra to give it. “We had a player booked the other day for a similar thing that they got a penalty for. Tuesday’s defeat means United have lost three straight games for the first time since 2001, having been knocked out of the FA Cup by Swansea on Saturday following a 2-1 defeat by Spurs. Even if we disregard the hysterical tabloid response to any minor setback for the Premier League champions, this is beginning to resemble a full blown crisis. Moyes’ predecessor Sir Alex Ferguson sat alongside former United greats Sir Bobby Charlton and Bryan Robson in the stands at the Stadium of Light on Tuesday night – the stony-faced trio of wise and not-so wise men providing a reminder of happier times, or certainly in Robson’s case, merrier ones. Asked if their presence was an added burden, Moyes said: “Not at all. Alex is a great sounding-board for me. He is there to help, so is Sir Bobby. Moyes, the newcomer, is obliged to defer to and listen to such revered figures, but one wonders whether, in the long run, he would be better off striking out and being his own man.